I’m here to make your Thursday just that little bit sweeter with these Peanut Butter Rice Krispie Bars, AKA my latest chocolate obsession. 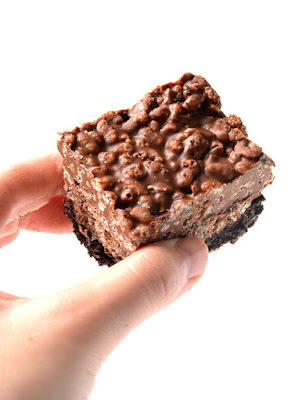 These deliciously easy, no bake treats have a crumbly Oreo crust and crunchy choc topping made with chocolate, peanut butter and rice cereal. Lightly grease and line an 8 inch square pan with baking or parchment paper, ensuring two sides overhang. Add Oreo cookies to food processor and whiz until crushed into fine crumbs. Pour over butter and mix well. Place your crumbs into your prepared pan and press down gently to form one even layer. Pop in the fridge. Add milk chocolate and dark chocolate to a heat-proof bowl and melt in the microwave, stirring every 20 seconds. Add peanut butter and stir until smooth. Pop back in the microwave until smooth if it’s still lumpy. Add rice cereal to a large bowl. Pour over melted chocolate mixture. Stir quickly to completely cover cereal in chocolate. Pour over Oreo crust and smooth the top with a small spatula or the back of a dessert spoon. Place in the fridge for 1 hour or until set. Cut into squares and store slice in the fridge. 0 Response to "PEANUT BUTTER RICE KRISPIE BARS"